The act of writing a series of books that revolve around a few central characters is a tricky proposition. On the one hand, if the novels are thoroughly engaging, they undoubtedly will amass a devoted audience that effectively develops into its own niche market. On the other hand, the barriers to entry easily can become insurmountable to those who arrive too late. Film adaptations generally help to ease this burdensome transition. In the case of The Relic, however, the important details that could have turned the similarly titled debut collaboration between Douglas Preston and Lincoln Child into an enormous franchise were left by the wayside. The problem, however, had little to do with Preston and Child’s vision. Cinematic in scope, the stories they tell, which revolve around the adventures of Special Agent Aloysius Pendergast, are impossible to set aside. The Relic, however, was rushed to market long before the full scope of the universe that they were creating had come into full view. Regardless, Preston and Child kept pushing forward, though as they did, their output increasingly began to assume a serialized tone. To pick up one of their recent novels — particularly from within the trilogy of Brimstone, Dance of Death, and The Book of the Dead — was akin to walking into the theater halfway through a performance. In The Wheel of Darkness, the eighth tome to revolve around Agent Pendergast, the duo removed most of the obstacles that prevented newcomers from becoming engrossed in their endeavors. While it’s true that some of the events that transpire and the revelations that occur late in The Wheel of Darkness will have a greater impact upon those who closely have followed Pendergast’s journey from the beginning, previous knowledge of his life and his work is, for the first time since Still Life with Crows was issued in 2001, not a requirement. 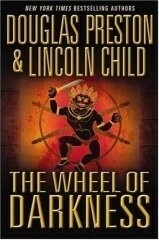 The Wheel of Darkness begins as Pendergast and Constance Greene descend upon the remote, Tibetan monastery where he once had studied. Instead of finding relaxation, however, they are asked to help locate a stolen artifact known as the Agozyen, which has the power to cleanse the world. The problem, however, is that no one seems to know what the relic is, or what it looks like. While tracking the Agozyen, Pendergast and Green uncover a brutal murder, and subsequently, they find themselves embarking on the maiden voyage of the Britannia. It’s here that the bulk of the story takes place. As the bodies pile up, and the passengers and the crew increasingly become restless and nervous, the tension builds to a feverish pitch.